April was quite a bit fuller than I expected. It was a good + sweet kind of full--but full, nevertheless. I'm looking forward to more rest and quiet this May--it just feels like a good month to finish up some loose ends on house projects, read, blog more, and enjoy the beginning of summer. Paint our front door. Nope. I did look at paint samples. I hope to do this one soon! Celebrate Luke turning 2. Yes, we did! We went to the Waco Zoo the weekend before his birthday and then also had a simple + fun day with him on his actual birthday. Read two books. I read, but I didn't finish anything. Oops. Blog more than once a week. I have felt a little out-of-routine this past month, so I'm hoping a fresh month (and lots of ideas + happenings!) will equal more motivation and time for blogging. Do at least two intentional activities with friends. Since I am such an introvert, I have to be super intentional about carving out time to spend time with friends. It's not that I don't like to do it (I actually really, really do! ), but it is often easier for me to stay at home or do my own thing. So, intentionality in this area helps me get in gear and do it! Read those books. Those books still on my shelves, yep, I'm going to read them. That's it! 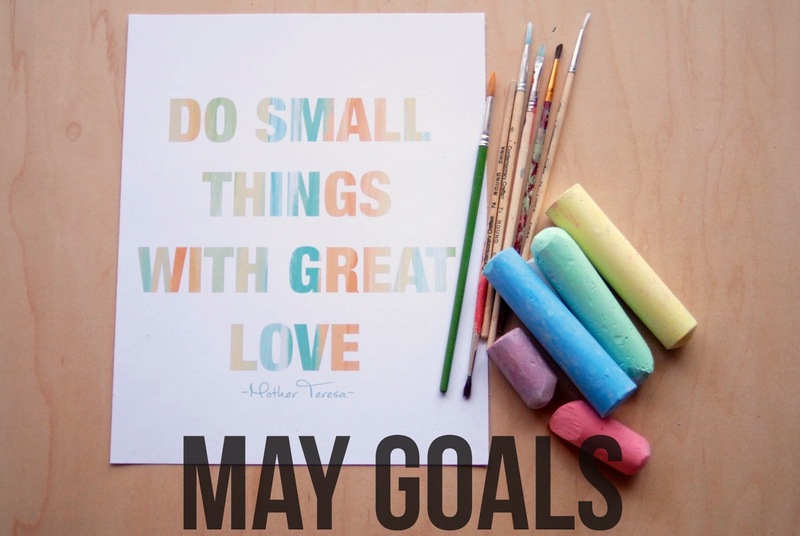 Well, those are the only goals I'm penning this month because I want to leave some room open for all the other fun + productive activities that May may or may not bring (like painting that front door or fixing the kitchen tile). This month is less about doing, and more about taking time to rest, take care of my body, and spend time with my family and friends. How about you? What does May look like for you? Ps. This print (one of my new favorites!) is on sale for $1 through Saturday. pss. 10% of this month's shop sales with go toward The Sparrow Fund. There are a lot of shops involved, so if you still need a Mother's Day gift idea, you should check it out!